I love wines from all over the world ... this one from Lebanon has been speaking to me lately! Visualizing a place Mediterranean ... ah yes. Presence of color - a deep yet brilliant garnet crimson ... glistening in the glass! Wild dark berries are immediately apparent on the nose - later a funky earthiness with exotic spices. Black and red fruits such as blackberry, juicy plum and cranberry emerge on the palate, with underlying hints of anise, licorice & black pepper. Woody herbaceousness. Silky mouthfeel. Tannic dusty finish. Complex & accessible all at once. $11.99/bottle. A wine for every day, at An Extra Ordinary Value! The vineyards of Château Ksara are located in the central and western parts of the Bekaa Valley in Lebanon. Climate is Mediterranean, with heavy rain/snow in winter and often dry, hot summers. Slopes of the Lebanon and Anti-Lebanon mountains provide plenty of water with their melting snows, as well as a unique micro-climate where night winds provide cooling from hot summer days. A varied terroir of chalk, clay, limestone and stony soil, along with such a variable climate affords distinctiveness and complexity. This Wine truly is indicative of "place". Tradition in Lebanese wine dates back 5,000 years, when the Phoenicians (ancient inhabitants of Lebanon) began tending vineyards and exporting wine to Egypt, Rome, Greece and Carthage. Here reportedly, is where the miracle of turning Water into Wine took place! 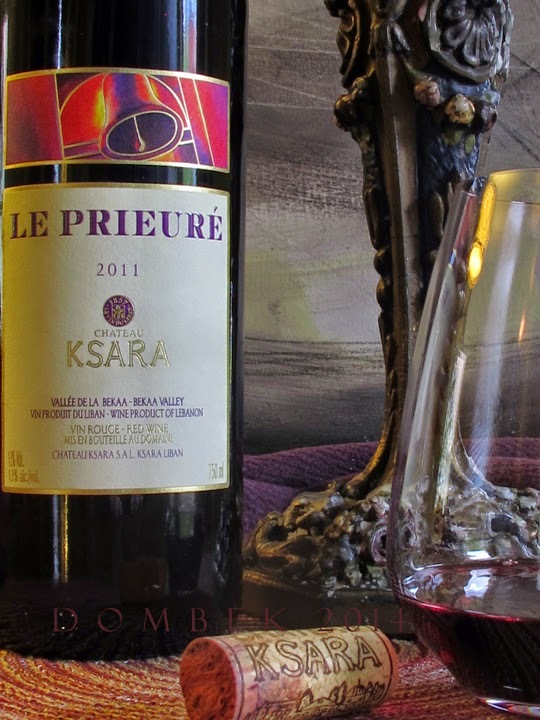 Château Ksara is Lebanon's oldest, largest and most visited winery, founded in 1857 by Jesuit priests, who produced the country's first dry red wine. All vineyards are harvested by hand and the grapes hand sorted. Wine is produced and bottled at the Chateau. Le Prieuré is distributed in Maine through Devenish Wines, Portland, ME and may be found at Rosemont Markets/Munjoy Hill & Commercial St. - Portland; The Farm Stand - S. Portland; State St. Wine Cellar - Bangor and The Blue Hill Wine Shop - Blue Hill. Imported by Olive Harvest LLC, Sudbury, MA.